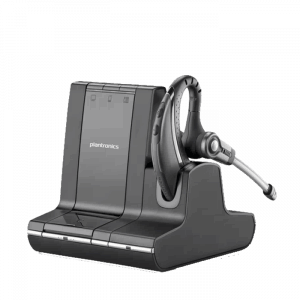 Plantronics Savi W700 Series Wireless Headsets - Headsets Direct, Inc.
What makes the Savi Headset a Small Business Life Saver? It makes my life easy! It’s that simple, but let me explain. Here at Headsets Direct, we are the typical small business with a staff of 10-15, and we all wear many hats. I may start as the IT guy…talk to customers throughout the day…and end up pulling orders in the warehouse. So what’s the key to success? You have to multi-task and everything you do must be productive. I honestly believe that my headset is a major key in my ability to get things done. 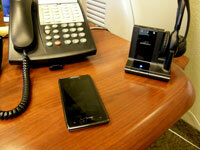 When I walk into my office in the morning, the first thing I do is set my mobile phone on my desk. At that moment, my wireless headset is ready to tackle all of my communication needs. We’re constantly testing headsets so we can share our experiences with our customers. But after all the testing, the one headset I always migrate back to is the Savi because of it’s unique 3-in-1 connectivity. It allows me to use one headset for my desk phone, mobile phone and computer conversations. Desk Phone – The majority of my calls come through our Avaya Partner multi-line telephone system. 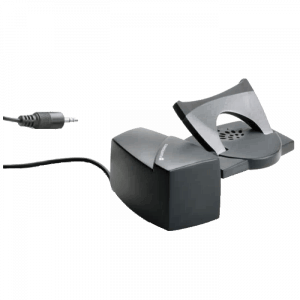 By using an optional Electronic Hook Switch (EHS) cable, my Savi will ring in the headset when I have an incoming call. This is useful when I’m away from by desk, (e.g. in the warehouse) so I’m able to take calls and not miss them to voice mail…which then required calling my voice mail….and then returning a call. Huge waste of time. Computer – I’m finding it more productive to turn a traditional phone call into a video call. Using Google+ or Skype, I’m able to talk to my contacts and share my screen. This allows us to have more productive conversations because we’re sharing data instantly, not emailing back and fourth. With the Savi connected to my PC, I’m a push of a button away from a hands-free video call using the same headset. In addition, Plantronics has training webinars on new products. In the past, I would be broadcasting my webinar through my computer’s speakers which is very disruptive to others. By using a Savi headset, I’m not disrupting others and best of all, I can multi-task (e.g. organizing my desk or pull orders in the warehouse) as I listen. Mobile Phone – I’m in constant contact with our manufacturer, Plantronics, working with new products, availability, training, sales projections and numerous other tasks. I provide my Plantronics contacts with my mobile number so we’re not tying up one of our business lines. By using the Savi, I’ve simplified my life by only needing one headset. My mobile phone rings and I simply press the button on the headset to take the call. Because my Bluetooth mobile phone pairs with the base of the Savi, I now have the luxury of taking my mobile calls 350+ feet away from my desk. How’s the quality? If you call and happen to get me, you will hear a call that is crystal clear. As I talk to people I often point out during the call that I’m on a wireless headset and have been walking around while we were talking. The quality is so good, if I don’t tell people they would never know. The typical response is ‘Wow! I would have never known.” It’s important for me to walk around as I often head to the warehouse to physically look at plugs, buttons and any other headset components my caller has questions on. Being wireless lets me physically have the part in my hands as we talk instead of trying to look at a picture online. Wearing style – The Savi is a family of headsets with 4 distinct wearing styles, each with unique characteristics to best suit its user. I prefer the W8220, which is a headband over the head and speakers on both ears. When I’m talking to a caller, I like to have total concentration and covering both ears does that. Also when I’m walking though our office and I have the headset on, it’s a clear indicator to others that I’m on a call and not to interrupt. Once finished with a call, I slide it down and around my neck so others know they can now talk to me. Leatherette ear cushions come standard and provide a very comfortable fit for all day use. 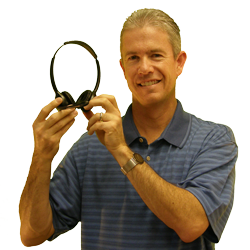 As technology continues to advance, so does the performance of good commercial grade wireless headsets. Plan on 6-13 hours of talk time and 350+ feet of roaming distance with the latest Savi headsets. W8210 is a headband over the head, with a speaker on one ear. This works well for users that need to keep one ear open and interact with co-workers. W730 is an over-the ear model for a very light weigh and discrete design. Choose from multiple ear tips and never mess your hair. W740 is a convertible which lets you choose between a single ear headband design or an over-the-ear design. The lightest of the family and our most popular. How can I prove the Savi’s a Small Business Life Saver? By offering at discounted pricing and letting you see for yourself! 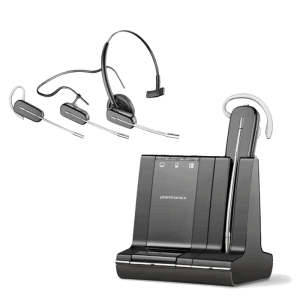 Plantronics for over 50 years has pioneered the lightweight headset, the mobile headset and noise-canceling technology, always driven by a single obsession: Remove the barriers to smarter communications. You can have approximately 38 units in one area without performance issues. As you exceed 38 W740’s, your roaming distance will diminish with the more units you add. Since every office is different in spacing, density and active units, the number varies per location.